Why are oil prices so high and volatile? McClatchy’s Kevin Hall and Robert Rankin take a look at the evidence and say that neither supply problems, demand levels, nor Middle East turmoil really seem to explain it. Some 70 percent of contracts for future oil delivery are now bought by financial speculators — largely big investment banks and hedge funds — who never take control of the oil. They just flip the contract for a quick profit. ….Exxon Mobil Chief Executive Rex Tillerson noted Thursday in testimony before the Senate Finance Committee that this year’s oil prices don’t make any economic sense, though that’s not quite how he put it. He said that current fundamentals and production costs would dictate oil in the range of $60 to $70 a barrel. That’s at least $43 cheaper than this year’s highs of $113 a barrel reached on April 29 and May 2. ….Prior to the 1990s, speculators made up about 30 percent of the futures market. 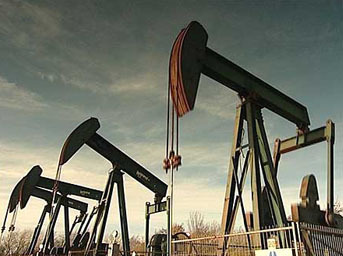 In the latest reporting period, the ratio on May 3 stood at 68 percent speculators to 32 percent users of oil. Meanwhile, the volume of total reported trades has grown five-fold since 1995, underscoring the impact of speculation on futures markets. This explanation for high and gyrating oil prices is — well, still speculative, I guess. There’s no smoking gun. But cheap money has to flow somewhere, and with housing in the dumps and the real economy still sluggish, there are a limited number of markets big enough to absorb huge quantities of short-term speculative investment. Oil is one of them, so it’s an obvious place to look.